We do everything from small farm projects to the largest commercial projects. Let us design and build for you. Gives us a call we look forward to making and keeping you as customers for years to come. Ethanol Plant Repairs & Shutdowns. U.S. Elevator is here to provide our customers with unmatched equipment pricing, install and service. We serve farmers, feed mills, elevators, fertilizer plants, ethanol plants and many others who rely on material handling equipment all over the USA and Canada. U.S. Elevator services any and all equipment we install, we also service existing equipment installed by other companies. We here at U.S. Elevator strive to keep our customers up and running with minimum down time. We look forward to gaining new customers as well a keeping existing customers for years to come. U.S. Elevator offers fully trained and professional crews. We will not be undersold or out done on quality and craftsmanship. We here at U.S. Elevator go above and beyond to provide a safe working environment for our employees and others who may be on the jobsite. We exceed any and all OSHA Requirements when it comes to safety. From start to finish we install and service equipment in all 48 states and Canada. At U.S. Elevator we offer site design from adding to existing systems to completely new state of the art systems. We take into all aspects of your project to save you build time and expenses in the future. Whether you just want to add something to your existing setup or start with a completely new site we have the knowledge and experience to do all the site layout and preparation for your facility. From flat slabs, bin pads, stem walls, basements to cement silos we do it all. U.S. 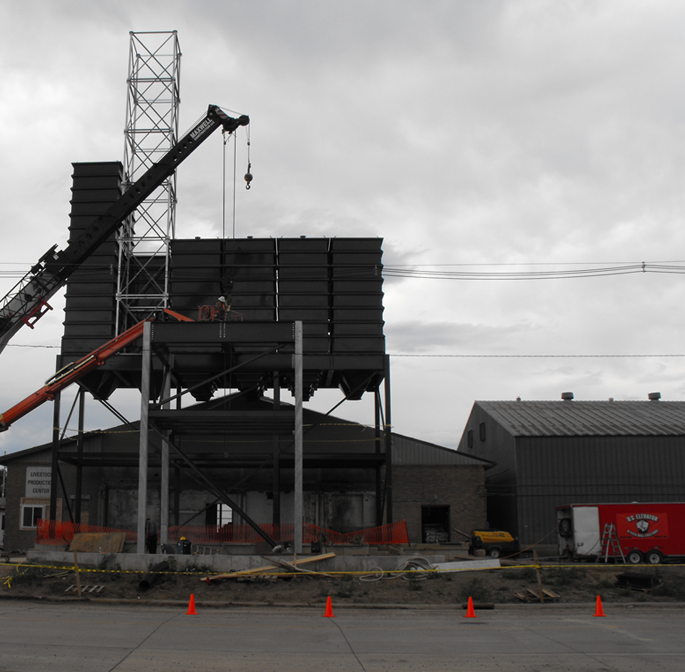 Elevator specializes in grain elevator, feed mill, and fertilizer plant construction services. We are the go to company when it comes to designing, installing, repairing, and new construction of grain handling, drying, and storage equipment. We offer a wide range of products and brands to fit your needs. We also offer custom built parts that may not be available any more. Whether you are looking at building a new facility, or repairing an existing facility U.S. Elevator is a one stop shop that can get the job done right the first time and on time. Our crews are very skilled and dedicated to quality for the customers we serve. U.S. Elevator not only builds for ourselves but also contracts out to many companies in the U.S. to erect anything ag related. We offer a full fleet of cranes to handle various jobs. With certified riggers and crane operators we take our jobs very serious to ensure the safety of our crews and anybody else working on the job site. U.S. Elevator offers an experienced and O.S.H.A. certified rigging and crane operator based crane service for all our customers needs. We offer an 80 ton and 110 Liebherr cranes. With a reaching capacity of 250 feet. U.S. Elevator offers a full line of equipment for the Grain, Feed, Fertilizer, and Ethanol industry. A few products we offer are Legs, Bins, Bulk tanks, Loadout tanks, Dryers, Drag conveyors, Mixers, Grinders, Augers, Grain dump pits, spouting and accessories. Plus many others. U.S. Elevator can custom build any size dump pit or load out tanks to fit your needs. U.S. Elevator also constructs buildings of any shape and size. Whether you are looking for a shop or a complete custom building for you Feed mill let us design something for you.